The expansion of the railways in the nineteenth century made travel more and more available to ordinary people and introduced the concept of travel for pleasure. It became possible to visit relatives who lived more than a few miles away, and even to have holidays at the developing seaside resorts. Inevitably leisure travel, which was given a huge boost by the Great Exhibition of 1851, was soon followed by a tourist industry and that industry included the production of cheap souvenirs. One of the most popular types of tourist souvenir was a piece of pottery with the name, and sometimes a picture, of the place visited. 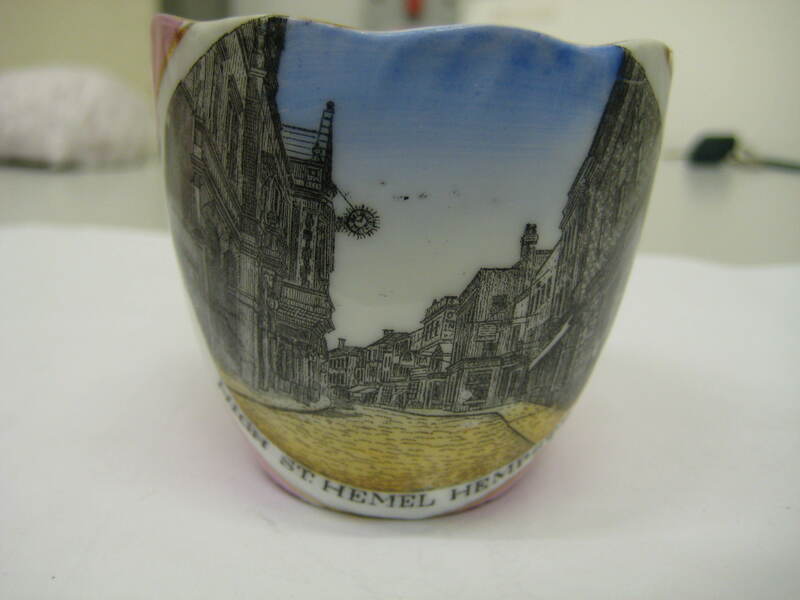 The history of pottery decorated with topographical scenes goes back to the late Georgian period when ‘blue and white’ dinner services began to be produced at many UK potteries, but especially in Staffordshire. These, however, were not produced as tourist souvenirs as they were aimed at the dining rooms of the gentry. The opening of the iron bridge over the river Wear at Sunderland in 1796, however, was the excuse for the production of creamware mugs decorated with a printed transfer of the bridge. Although not common today, they were made in large numbers and may be said to be among the first mass-produced topographical souvenirs, although the market for them was mainly in the North East. Scenes of the Wear bridge continued to be used by potteries in and around Sunderland and Newcastle-upon-Tyne until the later 19C on their famous lustre wares, although the large size of many of these pieces, precludes their purchase at souvenirs of a day out or a holiday. Examples will be found at most large antique fairs even today. 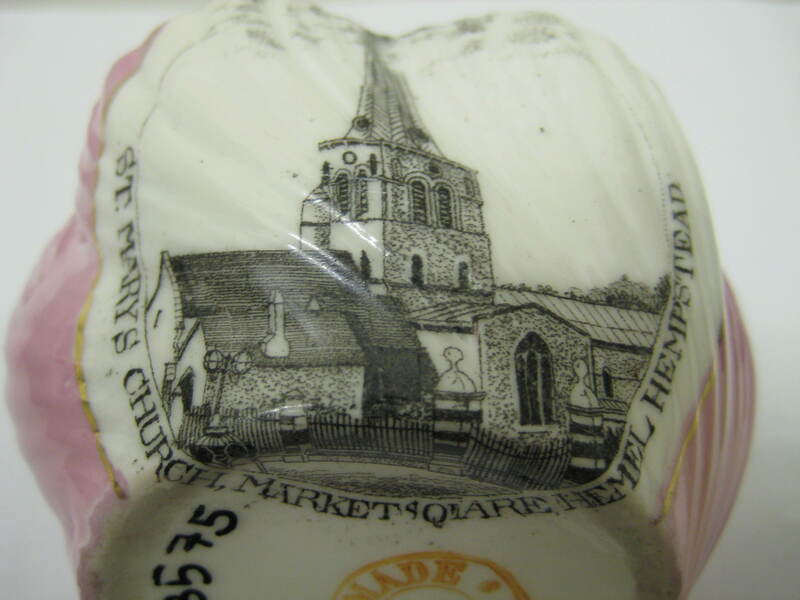 Mass travel, however, required small cheaply-produced souvenirs and from about 1880 demand was supplied by porcelain factories in Germany and Czechoslovakia. Within a few years most towns and many villages in England were included in the production. Topographical scenes were printed on cups and saucers, plates, small jugs, sugar bowls, mugs, and less commonly, candlesticks and small vases. The fabric of the porcelain was white but the area round the printed pictures was usually a lustrous pink, or less commonly green or blue. It is one such souvenir whose acquisition for Dacorum Heritage Trust was recorded in the 37th newsletter of the Friends of Dacorum Museum in September 2007. 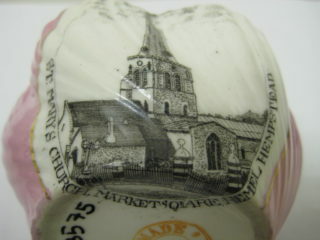 Several other scenes have been recorded including the high street in Hemel Hempstead, and St Mary’s Church and the market square, and the parish church (St Peter’s) in Berkhampstead (sic) (see illustrations.) and examples of these have now been presented to the Museum Trust by an anonymous donor. These souvenirs almost never have a maker’s mark, but some of them have ‘Made in Germany’, or occasionally ‘Made in Czechoslovakia’ printed on the base. Little else is known about their production although it has been suggested that they were mass produced in some of the prestigious continental porcelain factories, but not marked as they were considered rather inferior to the fine and expensive ornamental wares usually produced. Inevitably, the onset of war in 1914 brought the import to an end and one wonders what happened to all the unfulfilled orders that were unable to be delivered. In the 1920s the demand for tourist souvenirs increased again, but now they were produced in English factories. They are, however, not as colourful or delicate as their pre-war continental cousins, being mainly in glazed earthenware rather than porcelain. A general account of these collectable items can be found in Ian T Henderson, Pictorial Souvenirs of Britain, David & Charles, Newton Abbot, 1974.